I received your letter, also the papers, and was glad to hear you were quite well. I have also received the Almanac from Mr Boyd for which I will write and thank him. We have had very cold weather here all the winter, in fact I never felt so cold for such a length of time before, but the weather now is changing fast and before long we will all be wishing some of the cold days back again. Jamie went back to school on the 13th, we all went with him so far as Umballah (Editor’s note: presently named Ambala), about 80 miles from here. While there I went to see if Ann was there, although the regiment marched to Peshawar some months ago, they were left behind and she was confined of a boy three months ago. I was very sorry when I saw her to hear the trouble they had got into. Her husband has been reduced to Private and is a prisoner having been sentenced to 12 months imprisonment. He seems to have been harshly dealt with, by what I was told as the guilty party got off very cheap. It happened that he was acting Sergt Major of the depot and in charge of the Canteen, and allowed the person who dispensed the liquor to have too much of his own way, which he took advantage of. As the orders regarding Canteens are very strict, HUME, being the responsible party, went to the wall-poor fellow. He seemed cheerful enough when I saw him, he was in hospital and I went with Ann, but he will never be able to retrieve himself. He was to get a Sergeants pension and was eight years a Sergeant when he was reduced. Ann seemed cheerful and does not take it to heart, the children were all quite well. 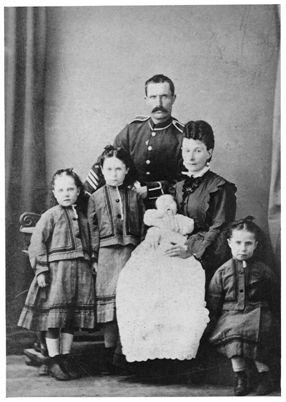 Joseph Hume with his family taken circa 1873 in Umballa, India, with his then family, showing from the left (standing) Ellen (Nelly) Hume: b 26th October 1871, Umballa, Agnes Ann Johnston Hume: b 10th May 1869, Edinburgh, Ann Paterson Hume with baby Joseph Alexander Hume: b 28th November 1873,Umballa, India, and (sitting) Mary Falls Hume: b 26th March 1868, Edinburgh. The photographer was Mr Alfred Sache of: Dugshai, Umballa, Jullunder, Meerut, Kasauli, Sabathu, India. Editor’s Note: You will note from the photograph that Joseph Hume has regained his stripes .This is at odds with Joseph Hume’s Pay Book which states that he had lost his stripes on the 20th November 1873.and was only to regain them on 3rd July 1881, however we see the newly born baby which occurred after his being reduced to the ranks. Baby Joseph was to die less than a year later 19th October 1874at Cherat near Nowshera, India. Another boy also named Joseph Alexander Hume, was born 11th December 1875 at Nowshera, India. There is a great change in Jamie this year. He has grown such a big fellow and if he is spared, he promises to be a big brawny man. He has got a lot of tufts of hair over his face which I used to torment about. I enclose his photo taken the day before he left . Poor chap, he felt very much going back and parting with us-it’s quite a scene to part the children, poor Ann sobbed the whole night. I sent you a copy of the report. I found it had never been sent, although I ordered it before I went up hill, but we left in such a hurry. I also sent one to Aunt Agnes, I have not heard from her for a long time-in fact it is sometime since I wrote-but I was the last, however I will write to her. I am sorry to hear she has been poorly, I hope she is quite well again. I mentioned to you before that, there was some word about sending me to Allahabad, but nothing official has been out as yet-I hope we won’t have to go, but if we have, I have no doubt it will better me in both position and pocket. I sent you a copy of the “Pioneer” in which someone speaks of the transfer of my Press to Allahabad, makes it out as settled and gives your ‘BOY’ a lot of soft soap; I send it as I know it will please you although it is only one of many. I wish I knew what I could send Mr Boyd for his kindness. Letty and the children are all quite well and send their love and hope this will find you enjoying some good health as am happy to say this leaves me. This entry was posted in 1874. Bookmark the permalink.